SAN MARCOS, CA – It was 1996 and Tomme Arthur was waiting for the trolley in San Diego to take him home. With nothing left to read, he flipped to the classifieds section — and subsequently turned the page to a new chapter in his life, one that led him to eventually become the Co-Founder of The Lost Abbey. “I had done a lot of drinking and some homebrewing in college and I thought this was a good chance to get my foot in the door,” said Arthur. Apparently Troy Hojel, the man who had placed the ad, thought so too. “I got a ton of responses and ended up going with Tomme,” said Hojel. The mission? Put together what would become La Cruda Porter, a beer that took the brewing world by storm, quickly winning a Gold Medal at the Great American Beer Festival. La Cruda is back, at least in a limited sense, for the American Home Brewers conference taking place in San Diego. But the original story is one that has become apocryphal in the brewing world — starting out not just coming up with a batch, but building a brewery. And so the story of La Cruda began. Tomme and Troy started building out the brewery, a process that took four months and a lot of hands-on labor. Hojel had rolled into town from Colorado, after his brother and a partner originally began work on the La Cruda Project and were in need of help. “I quickly realized that they didn’t have as much money as they claimed, so we were basically going to have to build the brewery from the ground up,” said Hojel. Enter Skip Virgilio, the former brewer at Pacific Beach Brew House. With the opening of La Cruda just around the corner and the brewing equipment still not 100 percent installed, Troy and Tomme again turned to Skip for assistance. At the time, Skip had founded AlesSmith Brewing Company, which he has since sold. “The brewery wasn’t quite ready to have beers made, so they contracted me to brew a recipe they had for a porter,” said Virgilio. The La Cruda Porter was born. Of course, once the brewing facilities were up and running at the restaurant, Tomme and Troy tweaked the recipe and made another batch. Perfect timing too, the Great American Beer Festival was just three months away. “The very first batch we brewed on that system ended up winning us a gold medal,” said Hojel. 15 years later, the group was at it again, brewing the beer for the American Home Brewers Conference. “It was fun to get the beer back into a glass and also share the joy of brewing with them again,” said Arthur. Tomme of course has come a long way since his days as an assistant with La Cruda. After a short stint with White Labs Yeast, Arthur accepted a position as the Head Brewer for Pizza Port. He is currently the Co-Founder and Director of Brewery Operations for Port Brewing and The Lost Abbey. As for Troy and Skip, they have left the brewing world, and now live vicariously through Tomme. “Deep down inside we all wish we could be brewery owners but it just didn’t work out that way,” said Hojel. 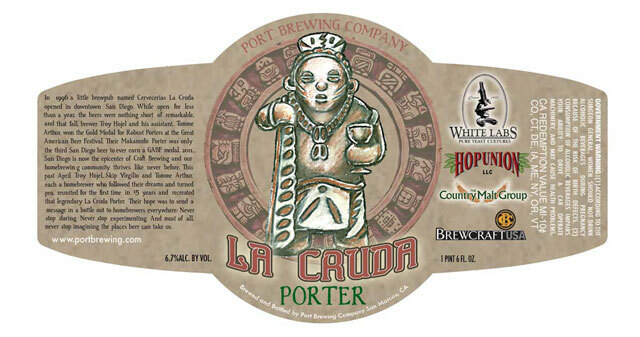 The newest version of the La Cruda Porter made its debut at the conference yesterday. While a majority of the 30 barrels brewed were donated to the conference, a limited supply is available at The Lost Abbey tap room. The recipe is also available online.